Hey y'all. Today's post has been inspired by the gradient of shades that fall under the umbrella of Radiant Orchid. When I first heard that Pantone's "Color of the Year" for 2014 was deemed Radiant Orchid, I thought to myself, "I was already rockin' this last year." In fact, for the past two or three years, especially around Spring and Summer, I have been drawn to - with blinders on - lilac, lavender, and fuchsia-purple pastel shades. 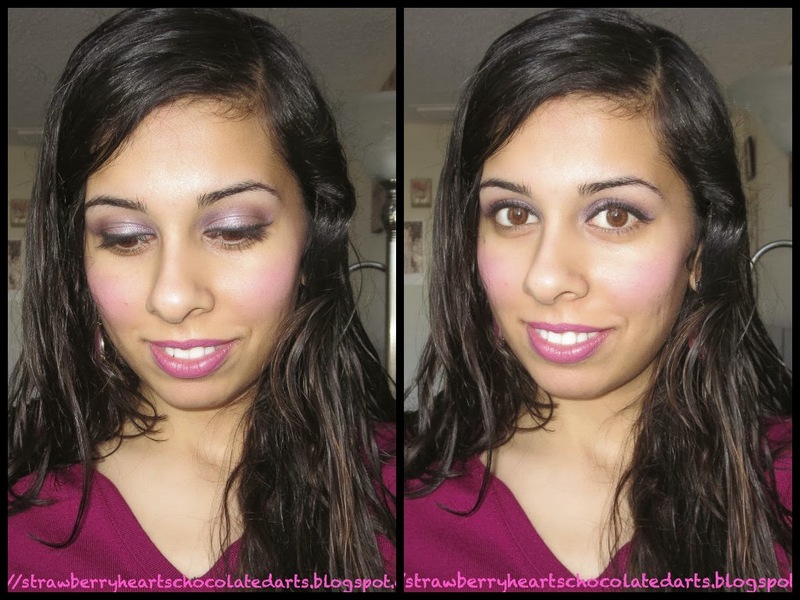 At first I was not planning on doing a post dedicated to the Radiant Orchid theme. I don't find purple based makeup particularly flattering on me. The closest I come to wearing purple based makeup is by wearing deep mauve pink and plum shades. 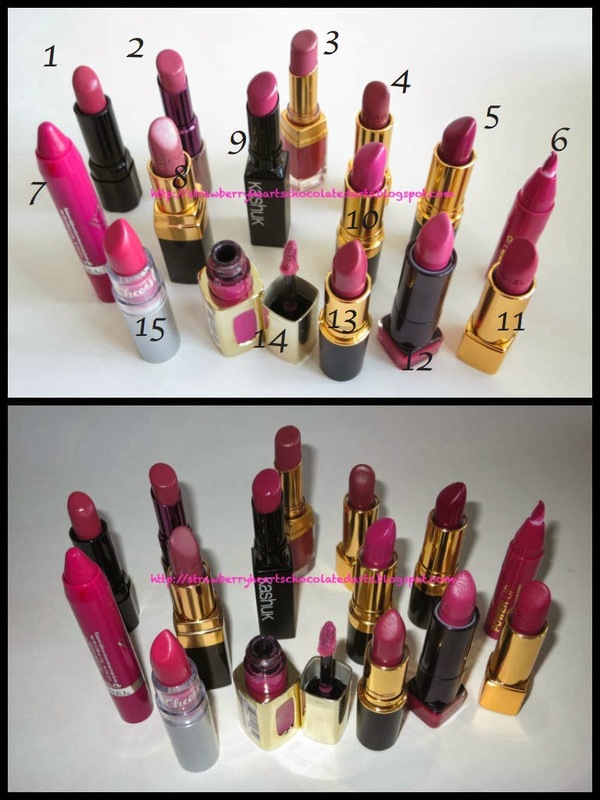 Recently, I tried a lipstick by Cover Girl in the shade Delicious. Although I have plenty of nail colors like the shade Delicious and do think such a shade looks lovely on my hands, I cannot carry off such shades on my lips against my skin-tone. Fortunately, thereafter I purchased another shade by Cover Girl called Tantalize. I believe Tantalize is exactly what I had expected Delicious to look like on me. So, Tantalize, which is the color I am wearing in the picture below, is the better suited version of Delicious for girls with a similar skin-tone as me. What am I wearing? Cover Girl Bombshell Shine Shadow in Oh La La Lilac on the eyes deepened with a matte plum purple shade in the crease and blended out; Milani Baked Matte Blush in Delizioso Pink; Cover Girl Bombshell Lip Perfection Lipstick in Tantalize. However, I did not stop here. I selected two more blushes and plenty of more lip colors as y'all can see from the pictures. I posted one of these images on my Instagram to give a preview, but then I got carried away. 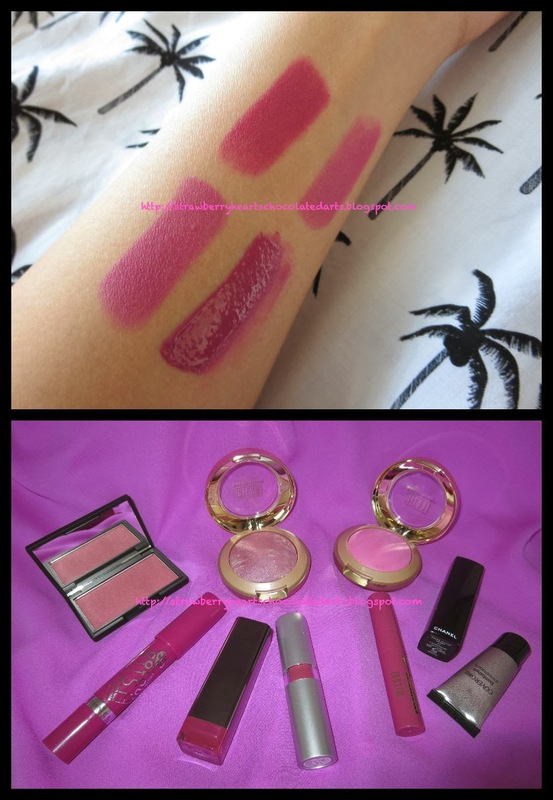 The picture on the top left corner, first box, are my blush selections: Milani Baked Matte Blush in Delizioso Pink (bottom), Milani Baked Blush in Fantasia Mauve (middle), and Sleek Makeup Blush in Pomegranate (top). 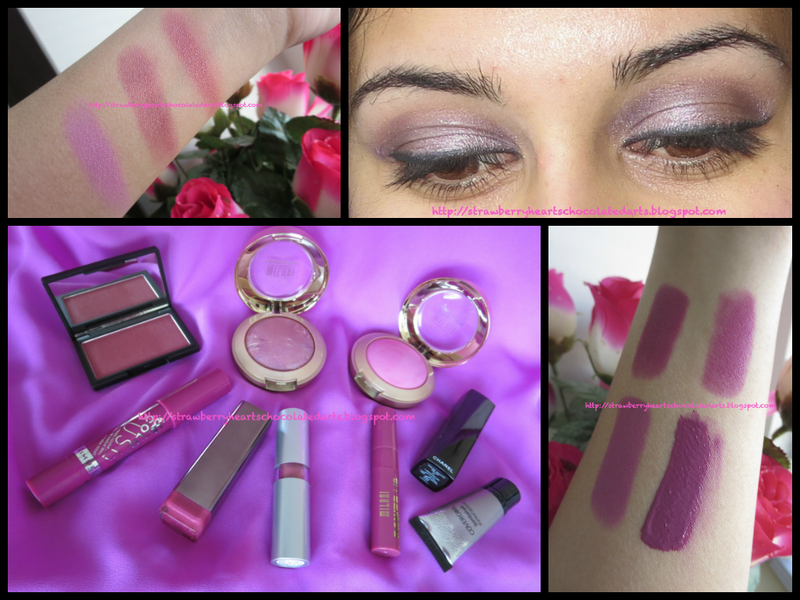 Chateau de Vine Lipstick in Show Off (top right), and Milani Power Lip in Raspberry Tart (bottom right). 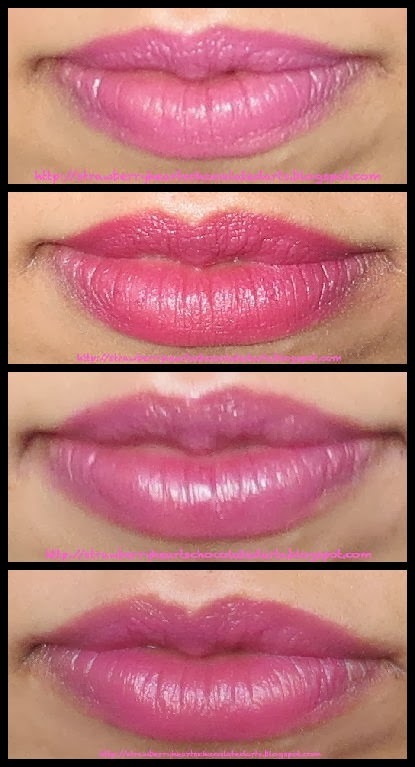 Here are the lip swatches to match the arm swatches above: Cover Girl Bombshell Lip Perfection Lipstick in Tantalize (first), Chanel Rouge Allure Velvet Lipstick in #47 L'Amoureuse (second), Purminerals Chateau de Vine Lipstick in Show Off (third), and Milani Power Lip in Raspberry Tart (fourth). 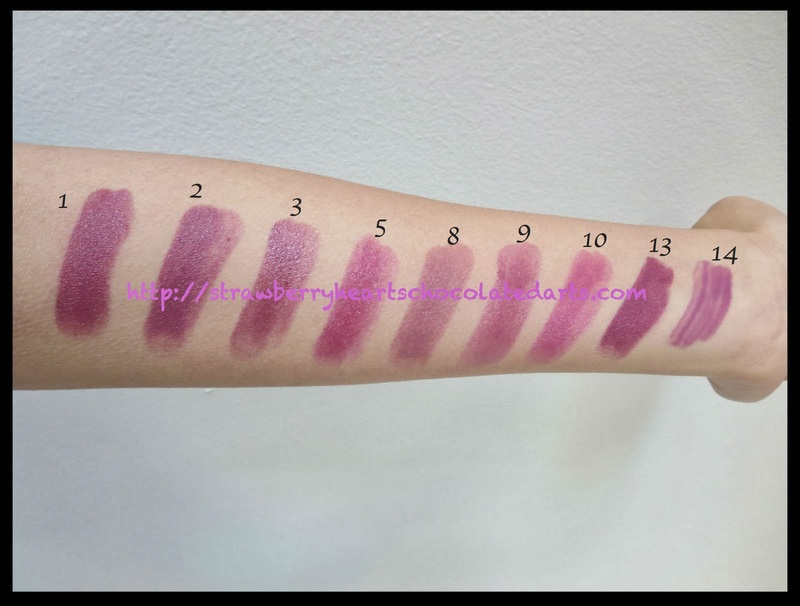 Adding Rimmel London Lasting Finish Colour Balm in Viva Violet (fifth) was an afterthought, so I do not have an arm swatch for it. Y'all may think the inquiry stopped once I added a fifth shade, right? Hereafter, I posted the picture above where I have displayed all of Radiant Orchid selections on Instagram. I think I gravitated towards the products mentioned above because they are all new additions to my makeup collection. Once I posted the picture on Instagram, I thought to myself that I must have other colors that might qualify as a Radiant Orchid shade. Indeed, I was right! At this point I was overwhelmed by my findings - so many similar shades! What was I thinking when I purchased all of these lipsticks? I was also feeling too exhausted to create more makeup looks or photograph these shades on my lips, so I hope y'all won't mind the arm swatches. I will add links to the review posts for any of these lip colors below that I may have already reviewed. Honestly, the way I actually wear makeup in reality does not justify my lipstick collection. Gel eyeliner and lip balm are my staple. I rarely actually wear makeup unless my Beau is taking me out. Sigh! I am glad I had this eye opening experience, however, because now I think I might place a ban on my lipstick shopping as I did with nail polishes last Summer. The nail polish ban was not difficult at all and I continued the ban till January. I am planning on doing a blog sale. I have mixed feelings about it though. 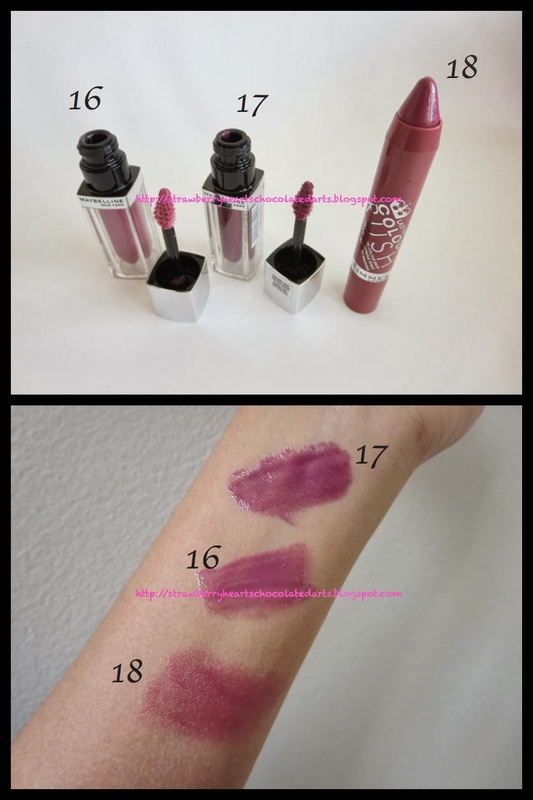 *I decided not to swatch (4) Chanel Rouge Allure in #108 Determinee because it is more of a muted mauve pink with a brown base, so it does not truly come under the Radiant Orchid category. This post took a lot of work. I kept going back and forth, adding more lipsticks, taking more pictures, editing, watermarking, and it all happened in annoying incriminates. At this point it would have driven me nut crackers to take another picture without (4). I hope this post was informative and helpful. Your friendly comments are much appreciated. So beautiful! So many different radiant orchid shades! Wow, great work on this post! I think you are addicted to Radiant Orchid in the same way I am addicted to anything red ;). These colors look great on you, so I am not surprised you have so many! I even spotted a few I might want, even though I am not totally in love with the orchid trend and think it looks ghastly on me. Such a great, comprehensive post hun! COMMENTS POLICY: I love to receive comments from my readers. It helps me know that I am reaching out to people who share my interests. One of my favorite parts of blogging is interaction with other "beauty enthusiasts" like myself. Feel free to inform me of your thoughts, opinions, and feedback regarding the subject matter discussed in the blog post. Please refrain from leaving comments that involve advertisements, giveaways, and any other promotions, including promotion of your own blog/social media forums. There is absolutely no tolerance for negativity or obscenity. ***Please DO NOT LEAVE LINKS OR HYPERLINKS in your comments! Copyright by Meesha Kaw. Theme images by latex. Powered by Blogger.